In my last column, I provided a run-down of the Jewish and interfaith individuals and bands inducted into the Rock and Roll Hall of Fame on April 15, 2012. The Beastie Boys was among the groups inducted. All three of its members were/are of Jewish or interfaith background. 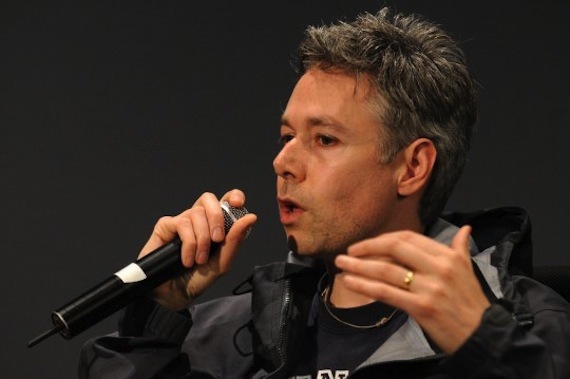 Yauch is the son of a Catholic father and a Jewish mother…He was raised secular. However, decades ago, he became a devout Buddhist. He is very involved in human rights campaigns that seek religious and cultural freedom for Tibetan Buddhists. Sadly, Yauch has been battling cancer for several years and was not able to attend the induction ceremony. As most of you probably heard, Yauch died of cancer on May 4. This biography is a pretty good one and the notes of praise about Yauch by his contemporaries in music and other fields are quite moving. On a much, much happier note, on April 25, E! Online broke the news that actress Drew Barrymore, 37, and her fiancé of three months, fine art consultant Will Kopelman, 33, are to be married on June 2, 2012. The wedding will be held at Barrymore’s estate near Santa Barbara, California. The E! report added that it was likely that the groom’s family rabbi would officiate at the wedding ceremony. Well, it looks like I was right about the Jewish ceremony. I also was apparently right about Barrymore not converting. Shortly after I wrote my January column, a tabloid invented a story about Barrymore converting to Judaism. This story was promptly denied by Barrymore’s press representative. But I’m not perfect. Back in January, I didn’t know that Barrymore was pregnant. That news came out about a month or so ago. I also didn’t know that the actress owned an incredible estate home near Santa Barbara. Barrymore bought the mansion in 2010; when it was for sale, there were a lot of outside and inside photos of the place posted onine for prospective buyers. These photos of Barrymore’s “make you drool” homestead popped up all over the internet the day it was announced that her estate would be the site of the upcoming wedding. This estate is a far cry from the small West Hollywood apartment that Barrymore and her single mother shared before Barrymore became a child star. Knowing that, I don’t begrudge her in the least having a fabulous home — she earned it. Finally, regarding the nuptials: I have to thank InterfaithFamily.com’s Managing Editor, Benjamin Maron, for pointing out the significance of the date (June 2) the couple have chosen for their wedding. In a blog entry, posted on April 26, Maron pointed out that a traditional Jewish wedding can only take place on one day during the 49-day period between the Jewish holidays of Passover and Shauvot (this period is called “the Omer”). June 2, Maron writes, is the first day after Shavout that falls on a weekend. (As he points out, it is a lot easier for friends and family when a wedding takes place on a weekend). The HBO series, Girls, premiered on April 15. It has received quite a bit of media buzz and it’s already been renewed for a second season. In my April 17th column, I gave some background on three of the four actresses who play the lead characters: four women in their early ‘20s who are sorting things out after moving to New York. Here’s a revised version of what I wrote, with more interfaith connections of which I have since learned. Jemima Kirke, 27, co-starred in Tiny Furniture as Lena Dunham’s sassy best friend. In Girls, she plays Jessa Johansson, an English girl who is the cousin of another lead character, Shoshanna Shapiro. The character of Jessa is very similar to the character Kirke played in Tiny Furniture. Her Girls character, however, appears to have to work to pay bills. In Furniture, Kirke’s character could just whip out her father’s credit card. I recently found out that Kirke is the daughter of former Bad Company rock drummer Simon Kirke, 62, and an English Jewish mother, Lorraine Dellal, 60. Lorraine’s father, Jack Dellal, 83, is a famous and very wealthy British real estate developer whose parents were Iraqi Jews. Lorraine’s mother, Zehava Helmer, is a former Israeli flight attendant. The premiere Israeli center for dance, Tel Aviv’s Suzanne Dellal Center, was funded by Jack in memory of Lorraine’s sister, who died in childhood. Zosia Mamet, 24, plays Shoshanna Shapiro, whom Dunham describes as, “A Jewish American Princess with an unexpected inner life.” Mamet, as I previously wrote, is the daughter of famous Jewish playwright David Mamet, 64, and his ex-wife, actress Lindsay Crouse, 63, a devout Buddhist. And, as I previously noted, Allison Williams, the real-life daughter of NBC news anchor Brian Williams, plays Marnie Michaels, Hannah’s best friend and roommate. So every lead actress in Girls is the daughter of at least one famous parent and three out of four are of interfaith (Jewish/Christian) background. These facts alone make for an interesting Jeopardy question. When I looked over the character names, I was struck by the fact that Johansson is the last name of the character Jemina Kirke plays. Is this an inside joke reference to Scarlett Johansson, another interfaith actress (Jewish mother) who, like all four of the lead actresses in Girls, grew-up in Manhattan? Dunham describes Shoshanna as Jewish and we know that Jessa is supposed to be Hannah’s “fairly close” cousin. My suspicion is that Jessa is supposed to be the child of a Jewish mother and a father named Johansson, who is of another faith — just like Scarlett — and the choice of her last name isn’t an accident. I doubt this was a conscious choice, but this “interfaith children of well-known parents thing” continues over to the music credits for Girls. A song written and sung by Harper Simon, “Wishes and Stars,” played over the end credits of the premiere episode. Simon, 39, is the son of the famous singer/songwriter Paul Simon, 70, who is Jewish, and his first wife, Peggy Harper, who isn’t Jewish. I gather that Harper Simon and the series co-producer, Jenni Konner, 41, have known each other for at least 15 years. (An InterfaithFamily.com visitor who knows the Konner family was kind enough to send me an email informing me that Konner is Jewish. I wasn’t surprised to learn, given what I wrote above, that Jenni Konner is the daughter of Lawrence Konner, a fairly famous TV writer, producer, and director). The show’s musical score is by Michael Penn, 53, a very successful musical composer. Like his actor brothers, Sean Penn, and the late Chris Penn, Michael is the son of a Jewish father, the late Leo Penn, a moderately famous actor/director, and a Catholic mother, actress Eileen Ryan. The brothers Penn were raised secular, but I heard years ago that Michael had become a member of a Protestant denomination. I would have to declare Girls the hands-down winner of the most “interfaith” TV show of all time as judged by the percentage (75%) of leading roles played by interfaith thespians. [*] It also wins the award for the highest percentage of lead cast members with a famous parent (100%). Schwimer, with his boa and backpack – a hazing rite. Maybe it will bring you a smile. My May 1, 2012 column provided a run-down of Jewish/interfaith major leaguers. I also mentioned the names of a few minor league baseball players who had some major league playing time last year and might be up again this year. Well, on April 25, right after I wrote my last column, the Philadelphia Phillies added relief pitcher Michael Schwimer, 26, to their big league roster. Schwimer, who had a bar mitzvah ceremony, was briefly up with “the big club” last September. 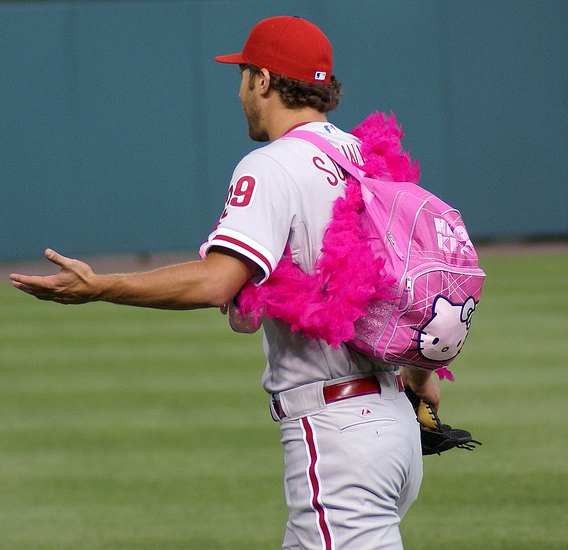 A video of him fulfilling a Phillies’ tradition was featured on ESPN that month: the 6’8″ Schwimer had to walk across the Phillies’ ballpark carrying snacks to the bullpen in a “Hello Kitty” backpack. He had to wear a pink feather boa and carry a pink purse. Team tradition requires the “most rookie” relief pitcher do this. [*] For those interested in stats of this sort, concerning big television shows, Star Trek, with three Jewish lead actors out of the six co-starring roles and Happy Days, with four Jewish lead actors out of the seven co-starring roles, always stood out in my mind as good Jewish Jeopardy questions. Star Trek had William Shatner as Capt. Kirk, Leonard Nimoy as Mr. Spock and Walter Koenig as Ensign Chevkov. Happy Days had Donny Most as Ralph Malph, Anson Williams as Potsie, Tom Bosley as Mr. Cunningham and Henry Winkler as Fonzie.